Research from NCCR MARVEL scientists and colleagues resulted in not one but two Editors' Suggestions in Physical Review Materials in November. 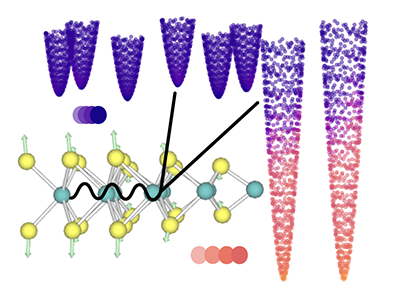 In one paper, "Mobility of two-dimensional materials from first principles in an accurate and automated framework," Thibault Sohier, Davide Campi and Nicola Marzari of EPFL and colleague Marco Gibertini , formerly of MARVEL as well and now at the University of Geneva, presented a first-principles approach for computing the transport properties of 2D materials in an accurate and automated framework. In the other paper, Topological phonons and thermoelectricity in triple-point metals, Alexey A. Soluyanov at the University of Zurich and colleagues provided strong theoretical and numerical evidence that for a class of metallic compounds known as triple-point topological metals, the points in the phonon spectrum, at which three (two optical and one acoustic) phonon modes (bands) cross, represent a well-defined topological material phase, in which the hosting metals have very strong thermoelectric response.